The low, broad mesa that gives Red Mesa Chapter its name dominates the horizon when looking north from U.S. Highway 191. It has been used as a landmark since ancient times. 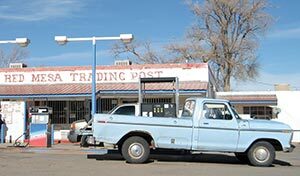 BOTTOM PHOTO: For travelers plying the lonely stretch of U.S. Highway 160 along the Utah-Arizona state line between Mexican Water and Teec Nos Pos, Ariz., the little trading post at Red Mesa is a sight for sore eyes. As we've traversed the Navajo Nation, we've heard plenty of chapter officials complain about arbitrarily drawn chapter boundaries that edge them out of resources. Perhaps no chapter has more right to complain than the pie-slice-shaped chapter of Red Mesa. Wedged between Mexican Water and Teec Nos Pos, Red Mesa's western boundary closely parallels well-traveled U.S. Highway 191 -- but doesn't include it. On the south, it slices about four miles into Arizona -- but avoids Highway 160 except for a remote three-mile stretch. The Four Corners Regional Health Center is just over the border in Teec Nos Pos. Most of the oil is over the border in Aneth (although an additional 50,000 acres is being eyed by Navajo Nation Oil and Gas Enterprise, according to Chapter President Herman Farley). The local aquifer is naturally contaminated with arsenic and other heavy metals. There are the requisite abandoned uranium mines. But the people Red Mesa Chapter are not a people to complain -- especially since they pretty much drew their boundaries themselves. In 1967, the residents here successfully petitioned the Council to secede from Mexican Water Chapter and form their own entity, primarily, said Farley, because the 23-mile drive to the Mexican Water Chapter House was prohibitive for most people at that time. "The elders felt like they weren't getting their share of chapter resources," Farley said. "They had difficulty even getting to the meetings." Whether separating from Mexican Water helped with that is debatable. Red Mesa could best be described as a chapter in waiting: waiting on Window Rock to certify it, waiting on Congress to decide who gets to administer the Utah Navajo Trust Fund, waiting for the next oil boom. In the meantime, Red Mesa is not twiddling its thumbs. Farley's strategy is to keep up an exhausting schedule of meetings, just to make sure nobody forgets Red Mesa exists, and patch together a safety net of state, chapter, federal and tribal funds to keep body and soul together until a fair wind comes along. On the day we visited, he was fresh off a meeting with Utah's lieutenant governor to try to convince the state to take back over the trust fund while Congress settles on a trustee, and headed to a meeting with Navajo Oil and Gas over the prospects at the Desert Creek oilfield. Farley, a former employee of Apache County's road department, is calm and quick-witted. But occasionally his frustration shows through. "We're suffering out here!" he blurted. "Every day we get an influx of people asking for a house, for help with weatherization, and we can't help them." Actually, little by little, they have been helping them. Patching together grants from Utah's Navajo Revitalization Fund, NAHASDA and the state's Olene Walker Fund for low-income housing assistance, plus some money from the Utah Navajo Trust Fund that had already been allocated before the fund was frozen five years ago, Red Mesa recently managed to complete new homes for 27 Utah families, reserving chapter and Navajo Nation capital improvement funds for five families across the state line in Arizona. Name: Named for the low, broad mesa that dominates the landscape and served as a landmark for early travelers. The Navajo name, Tsé Lich’’ Da'azkán’ ("Red Rock Mesa") is almost the same. Similar creative financing has enabled the chapter to undertake electric line projects, home renovations and soon, a $3 million community recreation complex and new chapter administration building. Chapter residents will finally get some relief from the bad water; Congress recently approved $13 million for the Indian Health Service to bring in water from Farmington. That project is already under way. The chapter owns its own grader, which means residents don't have to wait on the county to bail them out when the roads get bad. And, upon learning it is about 22nd in line to be audited by the tribe in preparation for getting certified, Red Mesa is exploring the possibility of hiring an outside auditor to do the deed. Farley, like all the Utah chapter presidents, is hoping for a breakthrough soon on the Utah Navajo Trust Fund, currently hovering around $54 million. The fund, made up of oil royalties to be used for the betterment of Utah Navajos, was frozen in 2008 when the state of Utah, facing a lawsuit by Utah Navajos alleging mismanagement, abdicated its position as trustee. Since then, Utah Navajos have been unable to agree on a new trustee, leaving several Congressional bills stalled in committee until they can get some unified feedback from the tribe. The trust has been placed in a holding fund, where it has increased with interest and payments of a $33 million settlement from the state, but isn't doing anybody any good. "We're asking the state to temporarily step back in," Farley said. "They're reluctant because last time they did it, they got sued. We're telling them, "Forget about it. That's history. That's long gone.'" Farley said the last set of negotiations went well and he's convinced Utah is on the verge of accepting the proposition, if the tribe can put some checks and balances in place so that those who administer the fund can be made to account for it. Meanwhile Red Mesa, unlike most Navajo chapters, is steadily gaining population, which brings a sense of optimism along with the urgency of providing the new residents decent roads and houses. The newcomers have found jobs with Resolute Energy Corp., the company that owns the oil leases in the north, along with the new health center and the Red Mesa School District. The district, which is in Arizona, recently found a resolution to the dilemma it found itself in in 2012, when it realized it was in violation of Arizona state law by busing students in from Utah. "The buses meet the parents at the state line," Farley explained, "and the San Juan School district beefed up its bus routes to take the students to its schools in Utah. It worked out in a positive manner." The chapter actively engages with the two school districts as well, most recently advocating for parents of students who were hospitalized after a carbon monoxide leak at Montezuma Creek Elementary. "It's our position, after interviewing people and giving it some study, that the leak was caused by the school's negligence and the district should pay the students' medical bills," Farley said. "Anything that involves the wellbeing of our chapter people, I feel like we should be involved." On its northern edge -- the fluted crust of the pie -- Red Mesa has about 20 miles of gorgeous San Juan River frontage, though most of it is inaccessible by car and not well suited for tourism. The Navajo Nation may eventually gain some land north of the river in the negotiations over the Utah Public Lands Initiative -- a massive effort to consolidate public lands and agree on how to use them -- proposed in 2012 by U.S. Rep. Rob Bishop (R-Utah). A Navajo group called Diné Bikeyah, which includes Council Delegate Kenneth Maryboy (Mexican Water/Aneth/Teec Nos Pos/Tolikan/Red Mesa) is agitating for a national conservation area on Cedar Mesa. Farley supports the move as long as it includes some area set aside for Navajo settlement. "Our chapter is so criss-crossed with pipelines that we can barely move," he said. "Some of our people may want to move up there." The prospect is getting some backlash from the non-Natives who have bought parcels in the heavily checkerboarded area, Farley acknowledged. "The white people -- the old people who have been in that area for a long time and know us -- say, "It's OK, we can live among the Navajo,'" Farley said. "But the new people, the ones who have moved in from somewhere else, it's making them nervous. They think we're going to kick them all out, but that's not what we want to do." Bishop himself has acknowledged the conflicts over land use in southern Utah were decades in the making, and aren't going to be resolved overnight. The dialog has barely started and will most certainly take years. It's just one more thing the people of Red Mesa will have to wait for.